1. Can't even imagine how it must be in Nepal; we in the Darjeeling-Sikkim region felt 2 aftershocks on 16May2015 (centred East of Banepa at 0920h IST and North of Ramechhap at 1704h IST). Fig 1(above): The epicentral plot of the main events and the major aftershocks associated with the Nepal 2015 Earthquake. For 7.8 event we had 6.1, 6.6, and 6.7 aftershocks. For the 7.3 we have had 6.3 and 5.7. So far no real anomalies except that 7.8 shock triggered a 7.3 event farther east. The aftershocks associated with the 7.3 event were located near the epicenter of the 7.3 event so nothing abnormal about that. The orange event (Fig 1) was yesterday's aftershock. Pretty much within the cluster. Not suggesting that the rupture is going farther east. At least not yet! 2. What I find disturbing is the fact that the aftershock 'epicentres' SEEM to be moving from west of Kathmandu initially, eastwards towards our area.Which I think you also pointed out in yr last letter (published here). Can this be correct? Yes! The aftershocks did tend to follow the Main Himalayan fault (MHT) from west to east. However, the map below (Fig 2) shows that apart from the Mirik event (27Apr2015), the earthquakes have been clustered within the area more or less defined by the two 7+ events. So I would say, no evidence of the aftershocks propagating farther east as of now. If aftershocks transcend the East and Central Nepal boundary, we really need to start worrying. Fig 2: Epicentral plots of the main events and the aftershocks associated with the Nepal earthquake 2015. 3. Without being an alarmist, I do hope our administration and political leaders are aware of the possibilities and consequences should an event take place here- having served in the IAF and worked in disaster management, I believe it is better to overreact in crisis situations rather than not react at all. I agree that we need to have a realistic disaster management plan in place in our region both in the short and the long term. That is the least we can do in the light of the fact that we have been made acutely aware of our vulnerability to big Himalayan earthquakes by the Nepal 2015 event and future projections of a 8.2 to 8.7 earthquake in our part of the Himalaya (Fig 3). 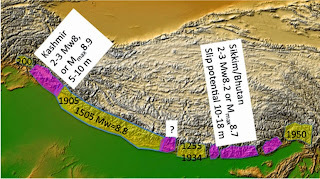 Fig 3: Darjiling-Sikkim is projected to be vulnerable to a 8.2 decollement earthquake in the future.